We have come across an amazing report written by people who practice oil pulling for oral health. A married couple experimented with oil pulling. They swished coconut oil in their mouth every day for about twenty minutes. 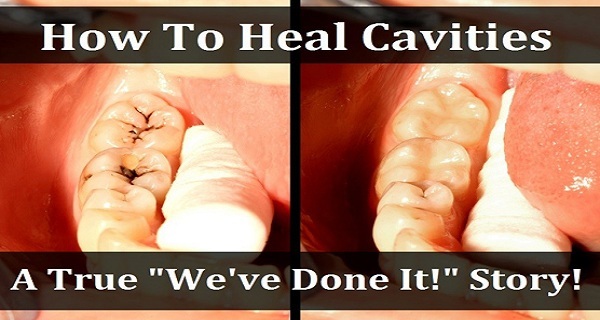 They claim that they have healed their cavities and their teeth are healthier than ever. They offer an explanation to their theory. The claims of these couple are really controversial since they are the opposite of what the orthodox dentistry claims. It claims that teeth cannot regenerate and they require certain repairs like fillings once they develop a cavity. We believe that once we get a cavity we need to instantly see a dentist and that we don’t have another option. However, have you ever wondered why other body parts can last a lifetime, still the teeth cannot? Broken bones can mend, but damaged teeth cannot. Is it possible for a tooth to last a lifetime? This is a solid question. Is it possible that teeth decay is just a product of the agricultural era and that our bodies were created to survive in the pre-agricultural era? There is a documentary about the ancient and remote tribe of the Sierra Nevada de Santa Maria. The documentary was made by Alan Ereira, an award winning film maker. According to this documentary the Kogi had flawless teeth yet they didn’t have any access to dental treatment. Many people have given their theories about the dental health of tribe people and they attribute the excellent health to the environment from which they take their food. The food of the tribal people wasn’t obtained from soils which lacked minerals like those of today. There is an amazing article written by The Wellness Mama about some dental findings of Dr. Weston A. Price, who is a dentist who has traveled round the world. During his travels this doctor has investigated and compared the oral health of people in some remote and native tribal groups. He discovered that even though these people do not have access to modern dental care, they have perfectly healthy teeth. What’s even more interesting is that Dr. Price observes that when these tribal people were given processed foods, their dental health degenerated. This research helped Price to conclude that what is essential to our health is a natural diet which is rich in bioavailable minerals, and that the right diet can prevent tooth decay and can heal the cavities. Is this a proof that there is a deep flaw in the agricultural method of modern times? There is a claim that lichens and similar microorganisms chelate minerals from the rocks and also that the chemical pesticides use causes depletion of the mineral content of the produce. This is why non-organic products have low nutritional content, pale color and bland flavor. The oil pulling method appears to clean and re-mineralize the teeth. It needs more research for sure, but this clearly deserves more attention and complete investigation.